Well It was bound to happen sooner or later.. Actually it was way over due. We got hit with our first significant cold front this winter... Went from running the AC, to turning on the heat in the same day.. Temperature dropped into the low 60's.. Which is why I have time to write this report.. Will be back on the mid to high 70s by the middle of the week. The beginning of January felt more like April then our typical January weather... Baby tarpon fishing was very, very good. Was good for bonefish and permit too..
Fished with My buddy Tom Saturday morning before the cold front hit.. Found a shrimp hatch with tarpon rolling and crashing shrimp on the surface,, Fun stuff! When fly ffishing I like to use a gurgler during shrimp hatches.. Like to watch them hit the fly on the surface.. 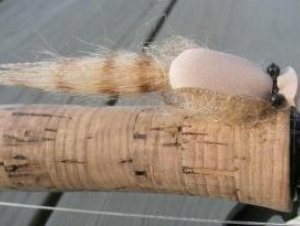 The gurgler is a killer baby tarpon fly, especially during a shrimp hatch. This tarpon fly imitates a shrimp and travels just under the surface, long slow strips will result in some explosive hits on top. Soft plastics and surface plugs are effective too..
Winter is Cuda Time here in the Lower Florida Keys.. Cooler water temperatures bring these big cudas up into shallow water to feed and warm up.. Sight fishing barracudas is a blast! They are extremely fast, takes are violent, they jump and will make long runs.. I target redfish on windy cooler winter days.. We don't have a lot of redfish here in the lower Keys, but we do have some.. Can find them tight against the shore lines out of the wind.. They love flies, crabs and shrimp.. 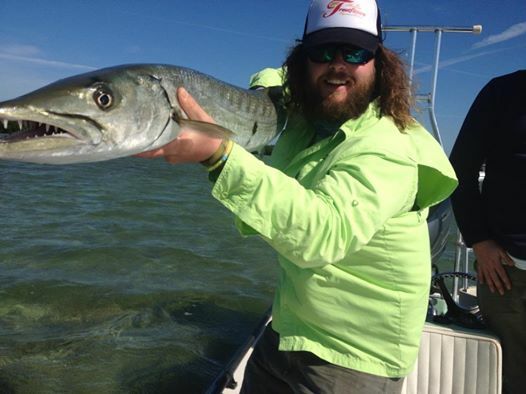 Still have days available for tarpon season.. Want to go fishing?